Flights into Budapest must arrive by 3:30 pm. Guests must be on board ship by 5 pm. The afternoon is free to enjoy Budapest on your own. Be sure to savor a piece of cream cake in the world-famous Gerbeaud Café, consider a scenic hike in the hills above the Danube, or a visit to one of Budapest’s world-famous thermal baths. DISCOVERY Enjoy an onboard beer lecture hosted by your Beer Expert while cruising to Bratislava. ACTIVE Follow your Avalon Adventure Host on a hike to lofty Bratislava Castle. DISCOVERY This evening, join your Beer Expert on a tour of local breweries. DISCOVERY Join a tour of one of the biggest breweries of Vienna and Austria. You may also take a tram to Austria’s Prater amusement park or to one of the many museums nearby. Consider joining an Optional Excursion to attend Royal Waltz Concert in an elegant hall. ACTIVE Take a Guided Hike up to the castle ruins to take in the spectacular view of the village, Danube, and the Wachau Valley below. Alternatively, consider a Guided Optional Excursion for a full day in Salzburg, Austria—the city of Mozart—or a Guided Optional Excursion to the picturesque Bohemian Czech town of Ceský Krumlov. You may join a Guided Optional Excursion to the Benedictine Monastery in Weltenburg. 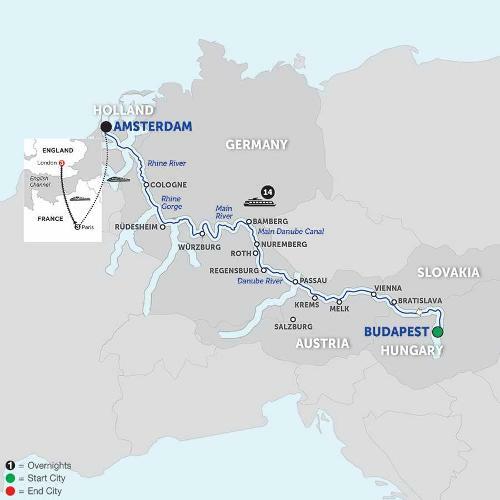 DISCOVERY While sailing to Roth, enjoy an onboard Lecture about the Main-Danube Canal—linking these two rivers to make a vital connection enabling navigation between the North and Black seas. DISCOVERY This morning also enjoy an onboard beer lecture hosted by your Beer Expert. Tonight, relax onboard with live entertainment as you sail to Bamberg. Enjoy live entertainment onboard while sailing this evening. DISCOVERY Later, enjoy a beer in a local brewery Later, enjoy onboard entertainment. DISCOVERY Enjoy a onboard beer tasting hosted by your Beer Expert. CLASSIC Join a Guided Walking Tour of a picturesque Mainriver village. Spend free time riding a bike through the beautiful villages on the Main river shores. Later, enjoy onboard entertainment as you cruise to Rüdesheim. ACTIVE Take a Hike up to the Niederwald Monument with your Avalon Adventure Host. DISCOVERY Later, Based on your departure, enjoy either a Coffee Tasting or a Wine Tasting. This afternoon cruise through the dramatic Rhine Gorge and see the famous rock of the Lorelei—where mythological siren lured ill-fated sailors to shore. Prost! Celebrate in the Rhineland’s Capital City. DISCOVERY End your city tour at a local brewery for a glass of Kölsch pale lager—locally brewed for over 100 years! Enjoy an onboard beer lecture and tasting hosted by your Beer Expert while sailing to Amsterdam. DISCOVERY Explore the iconic waterways of Amsterdam with a Guided Canal Cruise past stately homes of Amsterdam’s “Golden Age.” , followed by a real Dutch beer experience. Spend free time on your own to explore the colorful cafés, galleries, bridges, and canals of Amsterdam. See the highlights of Central Europe, as well as its beer and brewery traditions, on this enchanting European river cruise vacation. Guided sightseeing in each city is conducted by Certified Local Guides and shows you the must-see sights. Also, a Beer Expert will travel with you on the cruise portion of your vacation and will held lectures, tasting and will introduce you to food and beer pairing. Visit Vienna, charming Dürnstein, Regensburg, Nuremberg, medieval Bamberg, picturesque Rüdesheim, and Cologne. Also enjoy inside visits of Bratislava’s gothic St. Martin’s Cathedral, the amazing Benedictine Abbey of Melk, and Würzburg’s Bishop’s Residenz. Cruise through the dramatic Rhine Gorge past the legendary Lorelei rock; glide past quaint towns, beautiful scenery, and historic buildings along the Danube, Main and Rhine Rivers. During your cruise you will have the opportunity to join beer tastings on board or in local breweries. Your cruise continues into the colorful city of Amsterdam, where you’ll explore the Netherland’s capital city with a canal cruise, before traveling via high-speed train to Paris, where your Monograms vacation package of 2 days each in Paris and London begins, including VIP guided sightseeing and helpful onsite support from expert Local Hosts® in both these exciting cities. Additional Price Details: Port charges: $364.